Developer Bruno Fierens from TMS Software has released some free source code for implementing the SpriteKit framework in Delphi XE7 Firemonkey on IOS. Apparently SpriteKit handles things like animation, graphics, physics, particle effects, gravity, and more. SpriteKit is a native framework for IOS provided by Apple. The source code from TMS Software provides the Object Pascal interface to use SpriteKit. 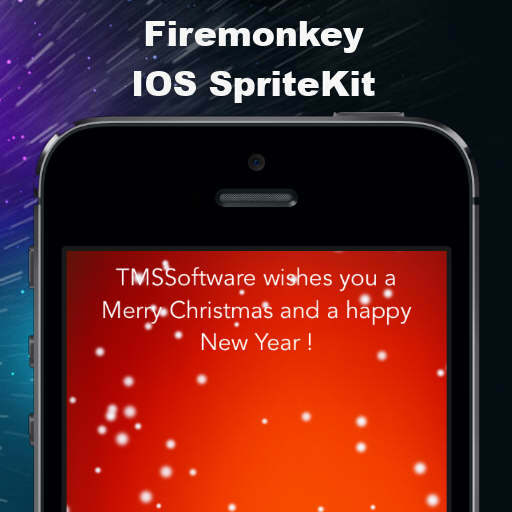 The provided demo which demonstrates the usage of SpriteKit with Firemonkey is a Christmas themed app with a Christmas tree and sprites that simulate snow. SpriteKit has it’s own sprite file format which you will need to pack your graphics in using Xcode. The snow is also hooked up to the TMotionSensor component in Firemonkey and changes it’s behavior based on how you move the device. There is a video that demonstrates the app and you should also be able to use this code in Appmethod as well. Obviously since SpriteKit is an Apple framework you won’t be able to use it on Android or Windows platforms. It looks like it may be possible to use SpriteKit on Mac OSX though. Head over and check out the full blog post and video before downloading the demo source code for Delphi XE7 Firemonkey.